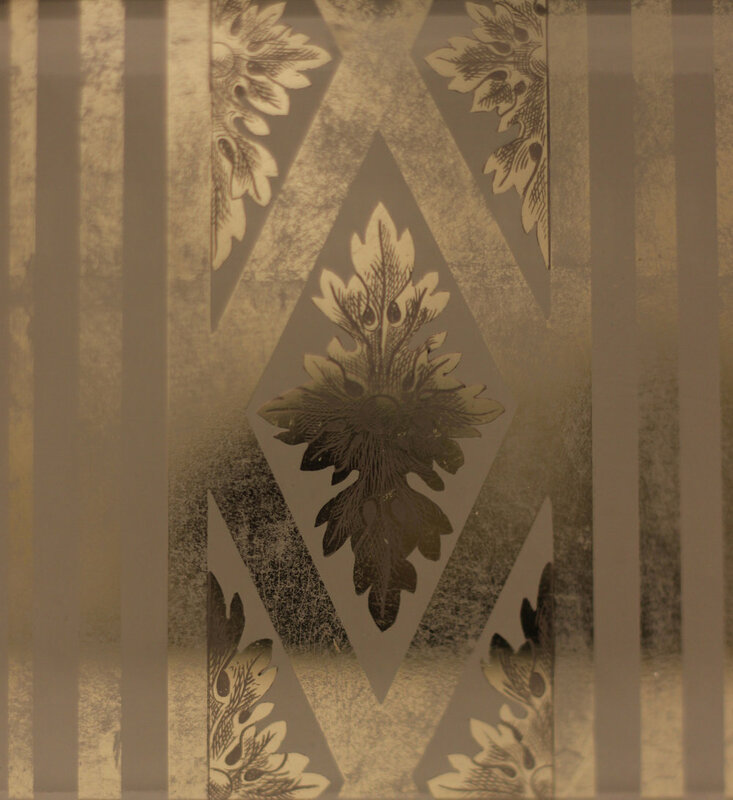 Verre églomisé is a technique dating back to the pre-Roman era, but its name is derived from 18th century French decorator and art dealer Jean-Baptiste Glomy (1711–1786), who is responsible for its revival. One of the key historical periods of the art form was in Italy during the 13th to 16th centuries when small panels of glass with designs formed by engraved gilding were applied to reliquaries and portable altars. In one of a number of related processes, the metal is fixed using a gelatin adhesive, which results in a mirror-like, reflective finish in which designs are then engraved. Working out of a light filled studio in San Francisco's Bayview district, Brigitte Michelet and Miguel Villafranca design with passionate care and precision to keep this centuries old fine art technique alive. 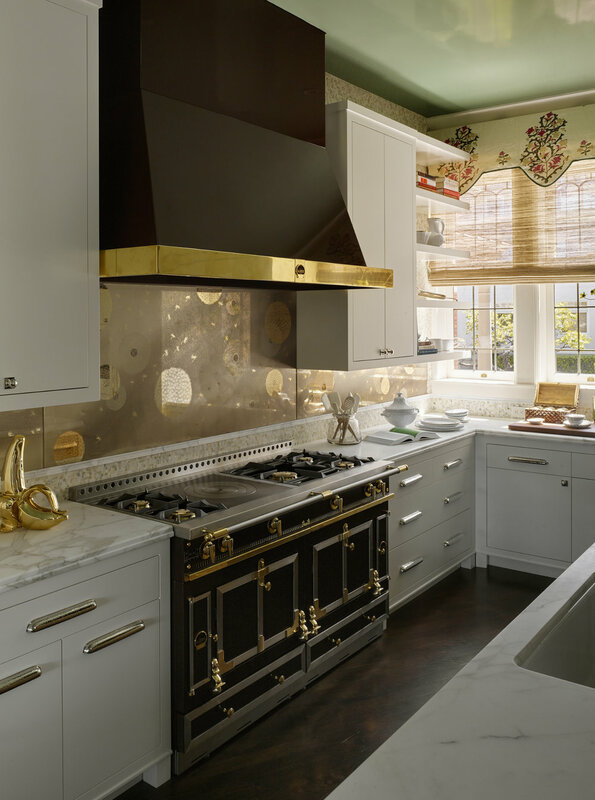 Collaborating with many of the Bay Area's top interior designers, their work graces the homes of knowledgeable clients that understand the importance of modern day artisanal patronage. I was welcomed into Villafranca Studios recently by Brigitte's warm smile and a welcoming discussion of the technique led by Miguel. 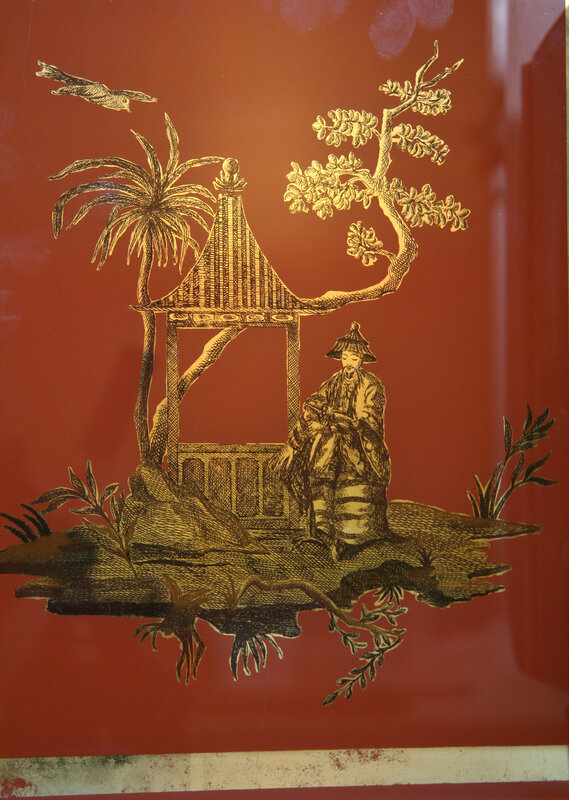 Theirs is a magical world where dreams come to life on the gold leaf adorned glass known as verre églomisé. Joseph Lucier: Tell us about your studies in Paris that laid the foundation as professional fine artists. Miguel Villafranca: I studied architecture at The École Nationale Supérieure des Beaux Arts. Besides the disciplines inherent to the profession of architect, there was a large emphasis on architectural drawing, composition, perspective, landscape and human figure. At the same time, I took private painting classes using mediums such as oil paint, acrylic paint, and watercolor. With the school of architecture, we traveled twice a year to Italy, Spain, the South of France, and the Loire country to sketch and paint cityscapes and landscapes. These memorable experiences strengthened my training. It was at that time and in this school that, Brigitte and I met. Brigitte Michelet: I also studied architecture for 2 years at The École Nationale Supérieure des Beaux Arts before attending The École Nationale Supérieure des Arts Décoratifs (ENSAD) for 4 years. Also casually called “the Arts Décos,” ENSAD is a school of art and design in Paris and is one of the most prestigious French grandes écoles. I graduated from ENSAD where I studied with great teachers in different fields such as illustration, typography, graphic design, colors, animated movies, and engraving gaining a broad education in all the visual arts. JL: What did you get out of being surrounded by centuries of art and architecture while being a student in Paris? MV: Through being surrounded by centuries of art and architecture from a young age I acquired something we can call a “cultural capital.” It’s something intangible that becomes part of yourself and guides your aesthetic taste throughout your life providing bases and parameters to evaluate and appreciate beauty. BM: I was born in Paris and studied there. It’s a magical city that had an enormous influence on me. I have always loved it, ever since I was a child, (I learned how to roller-skate under the Eiffel Tower!!). My exposure to Paris trained my eyes in a very unique way for all that is visual. JL: Do you think there is a stronger sensibility and appreciation towards craftsmanship in Europe as opposed to the United States? MV: I think that sensibility and appreciation towards craftsmanship manifest themselves in different ways in these two parts of the world. In the United States surprise and subsequently admiration and curiosity is often the response to a high level of savoir-faire. In Europe there is greater familiarity due to long-standing exposure to art in its many forms. BM: I will not say stronger but different. In Europe, a cultural heritage has been transmitted through generations. European countries have a lot of savoir-faire in so many areas and there is a strong sense of aesthetics. In France there is a culture of memory so to speak; there, for centuries people have kept track of all kinds of methods, techniques in very diverse fields (food, arts, artisanship, architecture, etc.). It’s quite amazing what kind of treatises you can find in specialized libraries! The influence of history is strongly felt in Europe. The USA is a vast country that integrated many diverse influences in a shorter time period; being a young country, there is tremendous enthusiasm and eagerness in welcoming new possibilities and discoveries. 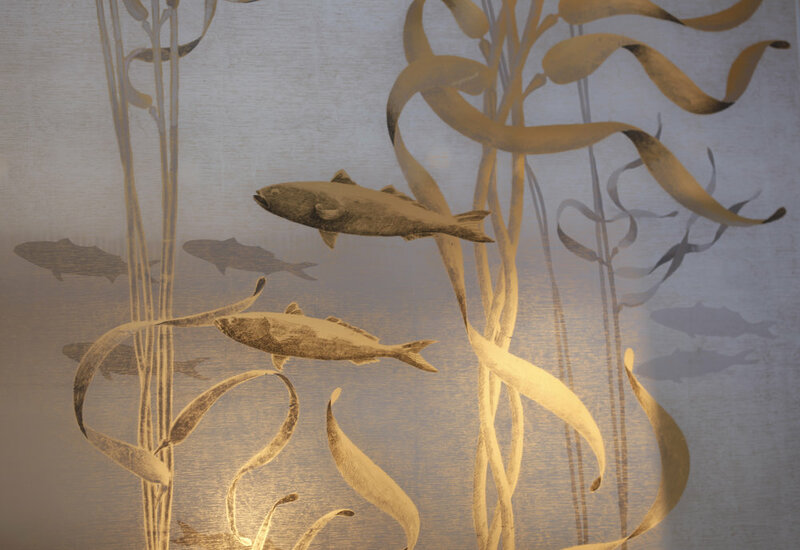 "I was fascinated by the double nature of the gold which appears darker or brighter and luminous depending on the circulation of light and depending on your own movement, revealing the kinetic aspect of églomisé glass which makes it so alive"
JL: What is it about verre églomisé that captured your attention and inspired you to learn the craft? 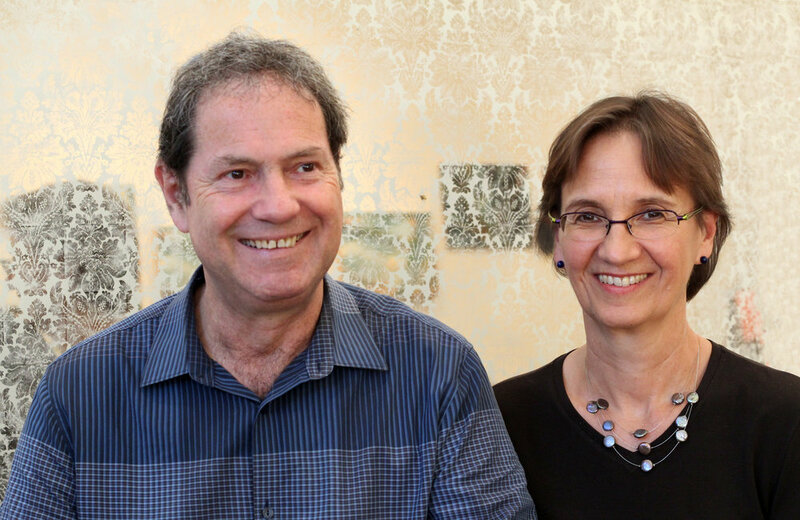 MV: Brigitte and I discovered verre églomisé many years ago in Paris while visiting an antique dealer. 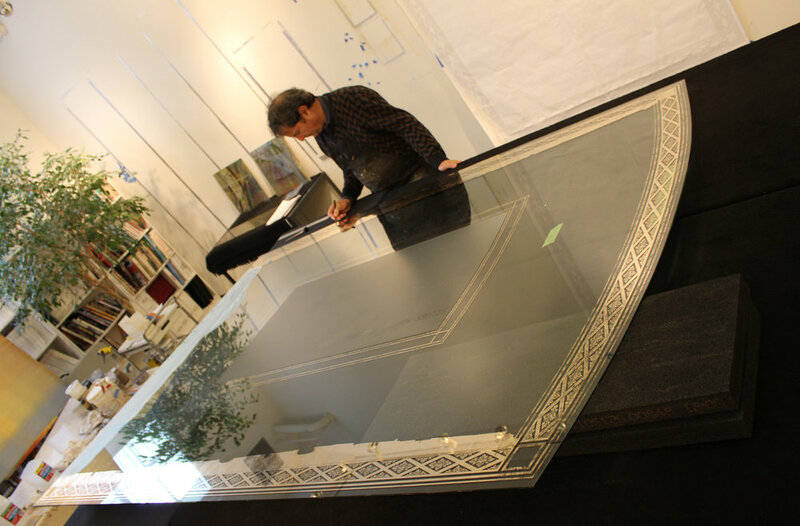 In his store, we saw a mirror with a frame in églomisé glass that left a strong impression on us. I was fascinated by the double nature of the gold which appears darker or brighter and luminous depending on the circulation of light and depending on your own movement, revealing the kinetic aspect of églomisé glass which makes it so alive. BM: Yes, definitively light was a factor in this love affair! There was also the challenge of working in reverse that was appealing. 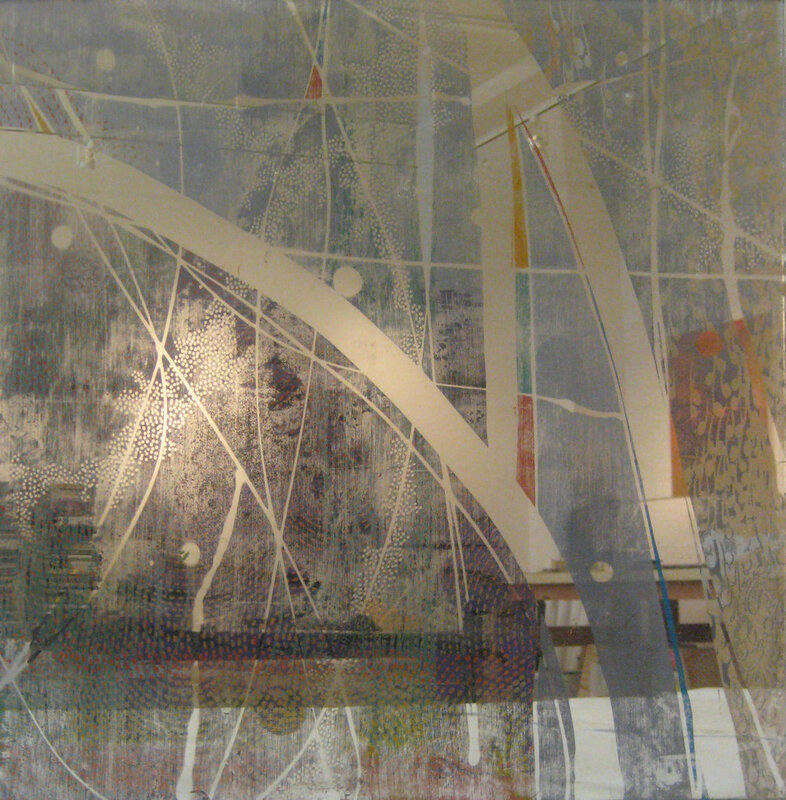 When you paint on canvas or wood panel or whatever substrate, you build up layers of paint towards you because you will look at the final painting from that same side, the reverse side is not visible and the canvas or wood panel will even disappear from the sight of the viewer under the layers of paints. In églomisé the process is different. We are not only working on the back of the glass but we are also working with a reversed layout. So here is the challenge, you have to control what is happening on the front because it will be the visible side and consequently there is not a lot of space for mistakes! The glass panel plays three important roles. It is the substrate on which precious metals and pigments are applied, it is an integral part of what is seen due to its unique property of reflecting the light, and it importantly acts as the protection to the artwork itself. JL: How difficult was the process of teaching yourself this art form? MV & BM: When we started to focus on this art form, we saw that we could incorporate our lifelong experience as illustrators and decorative artists in the fields of painting, drawing, engraving, gilding and illustration. It was a matter of adapting ourselves to working on glass and learning the principles connected to it. We used all the knowledge and experience we had accumulated until then to master what we have called Églomisé Architectural Glass. Our approach is a major change of scale from what the original technique was historically intended to be. JL: What are some of the technical aspects that you have mastered over the years? MV: I worked for 3 years in the 80s for a prestigious set décor atelier in Paris doing enormous canvases for the Opera de Paris and the Opera de Monte Carlo among others where I became very familiar with painting on a very large scale. Brigitte and I then became illustrators for magazines and books, drawing and painting on a very small scale; I switched from one-foot wide brushes to triple zero brushes, the smallest brush you can find! These two complementary experiences were very valuable to launch myself into the Églomisé Architectural Glass technique. BM: Conceptual thinking in design, drawing and engraving. JL: Have you had to educate design professionals to incorporate your work into their interior designs? BM: We had the incredible luck to be in contact with extremely educated and talented interior designers; they recognized instantly the high value of our work and what they could do with it; it is rewarding to see that what we do is inspiring for them. So the process in that case is very enjoyable and we are very grateful to be involved in remarkable projects. 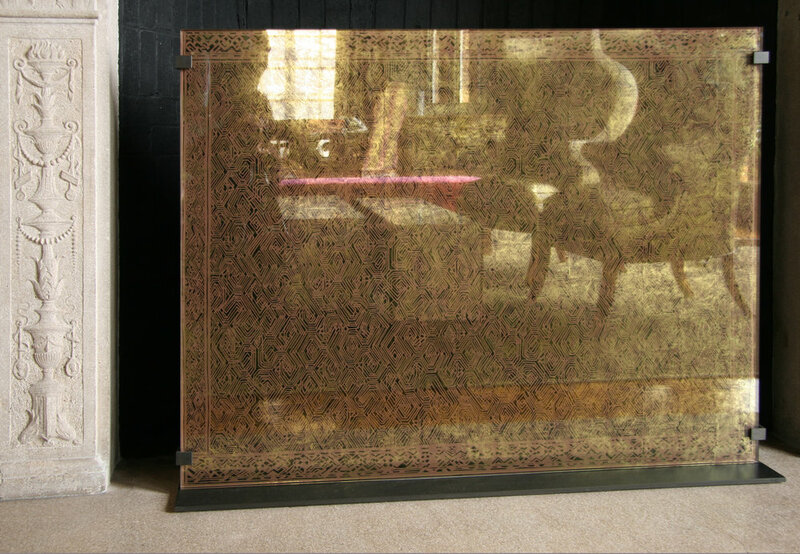 Sometimes we meet clients who don’t know much about verre églomisé, which is perfectly understandable as it is not a common form of artwork and craftsmanship. In that case, we can help them with ideas, suggestions, concepts, showing them a variety of possibilities. We love the collaborative process of our work. MV: Most of the time, the numerous samples we have, along with photos of completed projects, and a visit to our studio are enough to educate the designers or private clients who don’t know the technique of Eglomisé Architectural Glass. JL: Are there particular qualities or personality traits that you see in yourselves and artisans who design for the home? MV: A great attention to detail as well as to the whole finished piece within its context. The ability to control and master our work ourselves from the very beginning of a project to the very end, a process that is not so common nowadays. I would also add that most of the artisans we have met are very kind, very gentle people, passionate about their work. BM: I would like to also add that communication and the ability to listen are very important qualities in this profession. In the art field, sometimes respecting a project parameters can be seen as an obstacle to creativity, but I think it’s the opposite, they stimulate and promote creativity. JL: Do you have a favorite placement for your work OR is there a particular room in the home that best takes advantage of the technique? BM: Powder Rooms, Master bathrooms, dressing rooms, bar areas and kitchens are quite in demand because verre églomisé creates depth, space, and perspective along with an ethereal atmosphere. In addition, églomisé glass surfaces, in spite of their high refinement, are very easy to maintain and clean. Dining rooms, living rooms, foyers, hallways can be greatly enhanced either by églomisé glass paneling, an accent wall or an églomisé glass art piece. MV: Églomisé Architectural Glass enhances each place where it is installed playing the role of a jewel within the space. 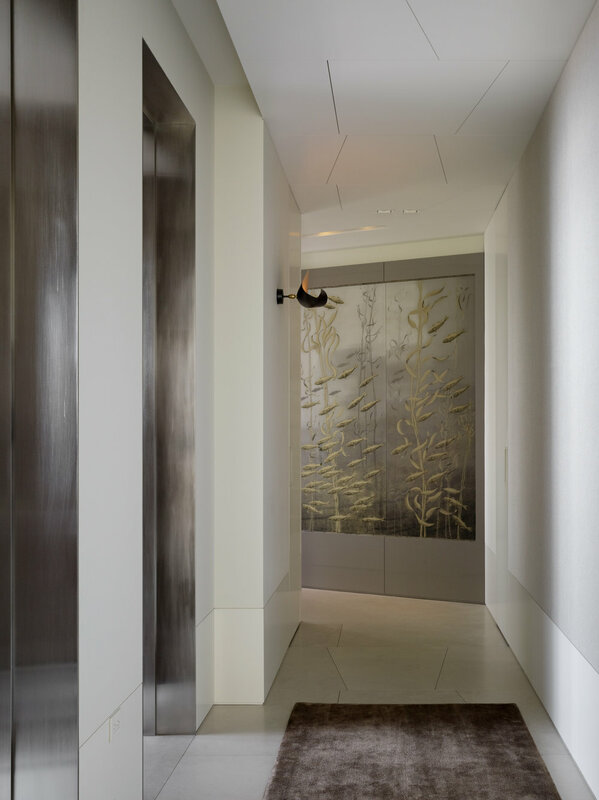 As we can control the level of reflectivity of the panels they can go in every room of the home. For example, in a dining room, we can completely reduce the reflectivity of the panels since people prefer not to look at themselves while eating. Nevertheless the églomisé glass will create a poetic atmosphere with depth, perspective and soft reflections. 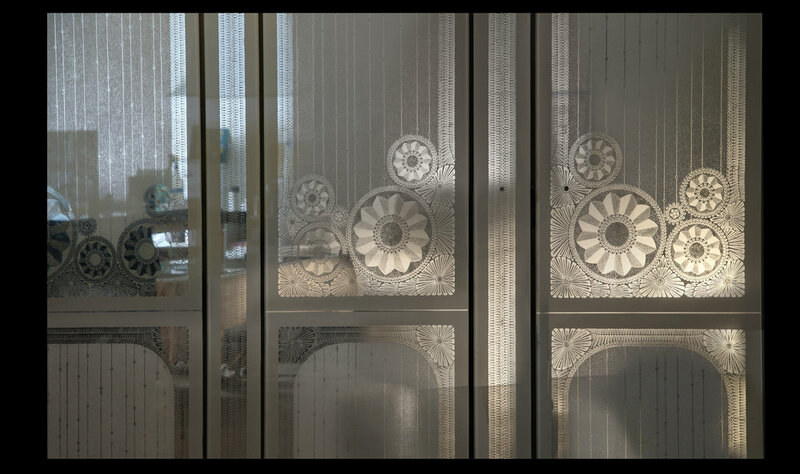 "Églomisé Architectural Glass enhances each place where it is installed playing the role of a jewel within the space." JL: What do you love about living in San Francisco? MV: I love San Francisco! I think it would be difficult for me to live anywhere else in California because of the beauty of the Bay that one can enjoy from so many places in the city. I also love how close it is to the ocean, wine country, and the mountains. I very much like the “Spirit of San Francisco” with its variety of people, and its multicultural aspect. BM: San Francisco is a very vibrant and alive city full of charm. Because of its unique and exceptional location, surrounded by water, the quality of the light is very special, there is something ethereal about this city, it has an ever-changing mood. I even start to find charm in the fog! I like the diverse neighborhoods and the San Franciscans so far have taken great care of their city through time and it is very rewarding. It’s also very urban but at the same time the relation to nature is strong here, which is very healthy and contributes to the feeling of wellbeing. MV: Flour + Water for its creative dishes and its laid-back atmosphere - Saru Sushi Bar in Noe valley, a tiny little Japanese restaurant with exceptional tasty sushis in a warm, cozy atmosphere - Locanda in the Mission. BM: Bar Tartine, my favorite Fusion restaurant, Una Pizza Napoletana, the most authentic pizza in San Francisco in a minimalist essential trattoria setting, and Farina. MV: I am reading three books these days: The Great Transformation by Karl Polanyi, Llamadas Telefónicas by Roberto Bolaño, and Rue Des Boutiques Obscures by Patrick Modiano who won the 2014 Literature Nobel Prize. BM: Right now I am reading several books, three by Pr. Michel Pastoureau on colors, Bleu, Vert, and Noir. He is the first historian to specialize in the history of colors in depth, it’s very enriching. I’m also reading l’Africain by JMG Le Clézio, a beautiful novel based on childhood memories in Africa in the 30s-40s . JL: What do you like to do in your free time? BM: I never lived in a city by the sea before, so hiking by the ocean is one of my favorites things to do, it’s really regenerating. Spending time with Miguel and friends in the city’s museums, parks and gardens, in particular walking the many stairways in SF, it’s a great way to discover many surprising sides of the city. 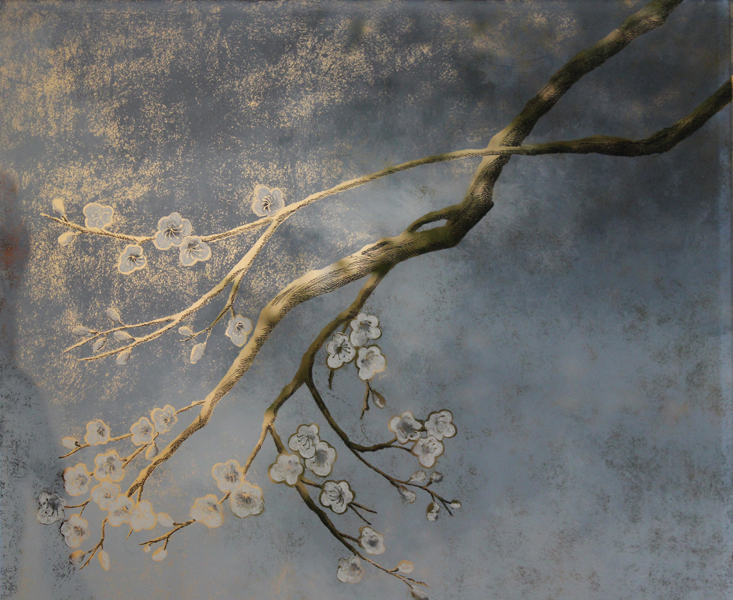 MV: Besides all the promenades we do together, I like to practice new techniques in painting like encaustics (beeswax and color pigments). Projects included in this piece are from work with ODADA, The Wiseman Group, Navarra Design, Jabarra Athas Associates, and Kathy Best Design. Photo credits: John Casado and Matthew Millman.